Ways to control gypsy moths include: Government aerial spraying of insecticide, and things that individual property owners can do themselves. Yes, the Government might spray for Gypsy Moths, and they may even do your property. However, they may not spray enough or use an insecticide that is very effective. This may may not be all bad. If they sprayed something more potent they might kill all the desirable preditor insects such as ladybugs, praying mantis and lacewings, as-well-as other beneficial insects such as bees and butterflies, and even birds and toads. Besides, the Government has been spraying Gypsy Moths for over a hundred years, and the moths are still with us and spreading. See our "Fighting The Gypsy Moths" section. If you want to your property to be protected you might have to join the fight. This tree is wrapped with 2 widths of duct tape at about chest height from the ground. Then Tanglefoot, a very sticky substance, is smeared around the center of the duct tape. (Hint: Use a popcicle stick, and don't get any on you! It doesn't come off of clothing, either.) Gypsy moths trying to climb up the tree will not go past the sticky tape. They will stack up there, where you can pick them off. We usually scrape them off with a pen knife or other object into a jar that contains a couple of inches of water and some Dawn dish detergent. This is time intensive if you have many trees, but it is effective. We destroyed thousands of them with this method. Don't smear the tanglefoot directly on the tree. Tanglefoot can damage the tree. Wrap duct tape around the tree, and smear the tanglefoot on the duct tape. Newly hatched gypsy moths feed day and night. But when they get to about ¾ inch in length, they feed mainly at night. They crawl down the tree in the early morning and look for a place to hide. They like the burlap; it makes a good hiding place. In the early evening, go out and lift up the folds of the burlap. Collect and destroy all the ones you find there. Repeat this process at least once every day. A 12-inch piece of burlap is tied around this tree. The burlap is then sprayed with the insecticide Deltamethrin. When the caterpillars walk across the burlap, the insecticide gets on their feet. As the insecticide gets absorbed into their bodies, it kills them. We did not use this method in 2007, as we found out about it too late. However we did use it during the 2008 season, and it worked well. 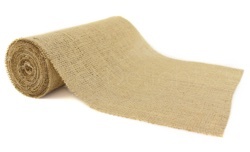 Follow this link to see Rolls of Burlap available from Amazon.com. Follow this link to see Sisal Twine available from Amazon.com. When the gypsy moths reach the moth stage, you can catch the males with gypsy moth traps. Males flutter around searching for females. 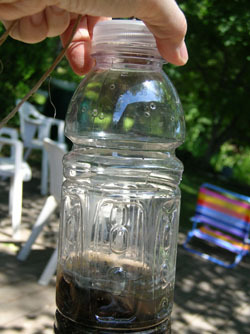 The traps have a bait inside their lid that smells like female gypsy moth pheromone, attracting males. The purchased trap shown does a good job of attracting the moths. They go in OK, but they often come back out. The homemade traps work a little better. Two different versions are shown below. They each have an inch or so of water in the bottom, with a little dash of Dawn dish detergent added. When the moths go in these traps, they get into the water and drown. They can't come back out. Around July, the female gypsy moths start laying egg masses. They lay them everywhere as seen by the examples on this website's where they lay eggs page. Soon after laying the eggs, the female gypsy moths die. Their eggs, however, will hatch next spring if they are not found and destroyed. We searched everywhere, and found and destroyed all the egg masses we could find. We know we did not find them all, but we feel good that we eliminated hundreds, maybe thousands from the next year's crop. Unfortunately, we could see many egg masses still up in trees on the underside of the tree limbs where we could not reach. Trouble next year. Gypsy moths are susceptible to a virus (nucleopolyhedrosis virus). 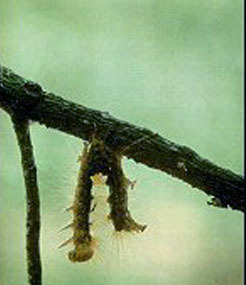 You sometimes see gypsy moth caterpillars hanging from a tree branch or trunk in an inverted "vee" position, as shown in the photo. Leave these where you find them so that other caterpillars crawling near them might also catch this virus. We have read that this virus is most prevalent in years when there is adequate rain in the Spring to make a moist environment. This keeps the gypsy moth populations lower. In dry spring years the virus is less prevalent and gypsy moth attacks are more severe. On our reference page, reference number 4 identifies 14 known bird species that prey on gypsy moths. These are: Bluejay, blackbird, catbird, black-capped chickadee, crow, grackle, red-winged blackbird, nuthatch, oriole, chipping sparrow, robin, tanager, vireo, and woodpecker. A friend did this in 2006 and again in the 2007 season. She claims that this helped; her property suffered less damage than similar nearby properties. Although spraying from the ground may not reach all the leaves on trees, it does help. However, spraying insecticide also kills beneficial insects like bees, ladybugs and praying mantis, and it can poison birds either directly or indirectly. Decisions to spray should take this into consideration.